The most famous of prayers in the New Testament, of course, it the Lord's Prayer, the pattern by which Jesus taught his disciples to pray. You can see my page on that prayer here or read the original in Matthew's gospel here in New English Translation. There are two significant things I'd like to point out about this prayer. First, we are praying for God's will and not our own. This is a key to any prayer, but takes a serious step in our own spiritual maturity. It's not easy to get to the point that it is not all about us, but it is an important step. Second, the very next verse Matt. 5:14 says that our forgiveness is dependent on our forgiving others. If we pray the Lord's prayer we say "forgive us.... as we forgive..." This is a necessary step to receiving and experiencing forgiveness and peace. When we struggle to forgive, we can ask God to help us. Another moment I would consider an example of Jesus praying is when he blesses the children. You can find this in Mark 10:13-16. We don't hear the words Jesus prayed over the children, but we see him lay hands on their heads and offer a blessing. I think again it sets an example; we too can ask God to bless the children in our lives. At the last supper, Jesus spent time praying for his disciples, not just for those twelve men and the women who followed him long ago, but for all of us who would come later as well.. This is recorded in John 17. Jesus prays for us to be united with each other and united with him and through him with God. This would be accomplished by the Holy Spirit whom Jesus had promised to send to the disciples. I find it meaningful that this is what was important to Jesus even as he faced his own death. The classic image of Jesus praying is in the Garden of Gethsemane after his last meal with his disciples and in the brief hours before Jesus is arrested and crucified. While the disciples don't understand it all yet, Jesus knows what lies ahead for him, even the death he will suffer to pay for our sin. Jesus invites his disciples to watch and pray even taking three of them further to pray with him. For all their good intentions they fall asleep. What is Jesus praying? 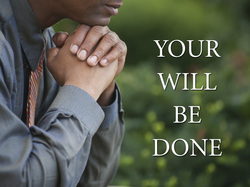 Though Jesus asks if this can pass him by, still he prays for God's will to be done, just as he taught his disciples to pray. Read the story here from Luke's gospel, Luke 22:39-46. Dear friend, I pray that all may go well with you and that you may be in good health, just as it is well with your soul.